This week on the Storyline Blog we’re launching our first ever case study. Yay! In a nutshell, in the summer of 2018 we were brought onboard JCC Payment Systems' massive online rebranding campaign. Our job was to write JCC's new corporate website. But as we soon found out, writing content is never far from making content work. To do that, we had to reconceive JCC’s whole website structure, its products and its core audiences. JCC is an instantly recognisable name in Cyprus. When we think of JCC, we think of the little icon on the Point of Sale machine while we’re paying by card in a shop, or of JCC Smart, the popular online payment portal. But JCC is actually a lot more than end-to-end payment solutions. They offer many other services like ATM management and hi-tech data protection and management schemes for banks and businesses locally and abroad, and they’ve been offering them for years. So in the summer of 2018, when JCC hired us to restructure and rewrite the content of their soon-to-be relaunched corporate website, we knew we had a challenging project on our hands. It wasn’t just the huge amount of content JCC had accumulated on their website over the years. JCC was now facing actual competition from other financial services providers who had recently entered the local market. They needed a complete makeover of their online voice so that they could stay relevant, and a more streamlined user experience so all those new users they were hoping to capture could easily find what they were looking for. The first thing we found was that JCC, like many established companies whose original websites had been set up eons ago, had a corporate website that was suffering from a pretty bad case of content sprawl. Our discovery process turned up pages of content written over the years by many different employees with varying levels of communication skills. None of that content was particularly user-friendly, compelling or engaging, and none of it was organised in a way that told JCC’s story. This was a shame because JCC actually had a great story to tell and it was getting lost in the static. Please don’t turn up your noses at posterboard. A giant piece of plain white, 100-gram, completely low-tech paper actually saved our lives—that and enough sticky notes to open up a stationery shop. The first thing we did was take JCC’s content requirements (the list of sections they wanted on their new website) and write them all down on sticky notes. Once we had all that soon-to-be-content laid out in front of us, we started putting it back together again, but with two questions in mind: What is each section trying to communicate to users and where does it belong in the overall structure of the new website? After we had a rough idea of where everything should go, we went back and did a deceptively challenging two-step exercise. First, we renamed the sections so that they were more intuitive and up-to-date and better reflected JCC’s current services. Then we arranged our content by organisational priority and audience. This was the difficult part, but it was absolutely essential. Because if we really wanted to create a more intuitive and efficient user journey for JCC, first we needed to know who they wanted to talk to. That meant identifying the specific audiences JCC needed to reach. We quickly discovered that rewriting JCC’s corporate website wasn’t just going to mean pruning and reorganising literally hundreds of pages of accumulated content. While we were putting all that content back together, we realised that JCC actually had two distinct audiences it wanted to reach: small businesses and, well, huge businesses. The first group was pretty straight-forward. JCC had a lot of clients who were merchants looking for payment tools for their shops or online businesses—and JCC offers plenty of solutions for small business owners. But the second group included local banks who needed cutting-edge data protection and management solutions or were thinking about opening up branches abroad. This was a whole new kettle of fish. Despite this new layer of complexity, identifying our audiences was a big breakthrough for us because it meant that we now we had an underlying philosophy for the structure of our website. Now that we had our user groups, we could also give whole sections of the website the right spin. The boring, not-very-descriptive “Other Services”, for example, was rebranded as “JCC Partners”, a place where local big businesses and financial institutions could find the tools they needed to enter the global market. 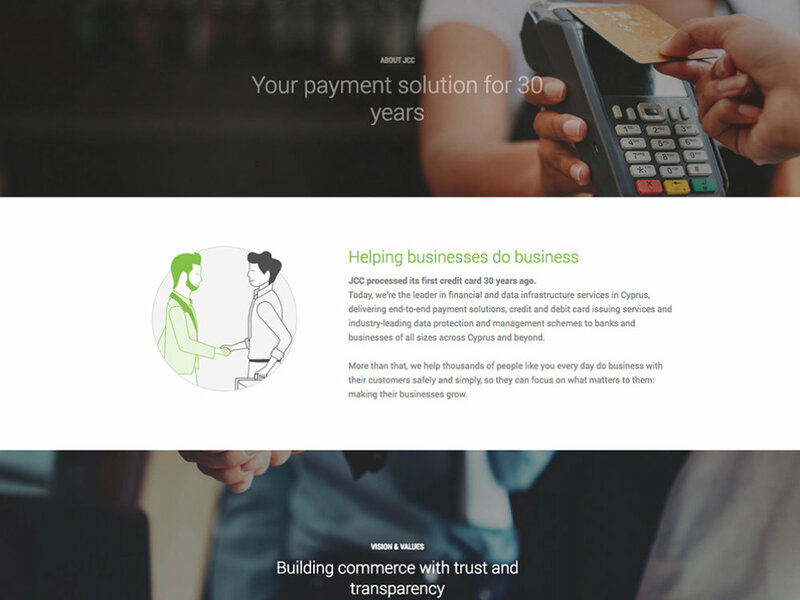 Likewise, the rigid and technical “POS Payments” now became “JCC in Your Shop”, a friendlier, instantly recognisable spot on the website that welcomed small business owners. The upshot? From a UX perspective, we could be sure that a client who owned a clothing shop and was looking for a simple in-shop payment solution would never wander over to advanced data protection schemes or ATM management. Critically, it also meant we could start thinking about how we wanted to speak to our users, which brings us to the all-important question of voice. Voice is always tricky, but one thing was clear to us. We wanted to move away from official, corporate-sounding, technical language that was talking at the user and move towards direct, accessible language that embraced the user and demystified the vast range of services JCC offered. More importantly, we felt that if JCC wanted to tell their story in a way that connected with both segments of their audience, they needed a new narrative. JCC’s new story would reflect their decades-long tradition of excellence, innovation and reliability, but it would also position JCC as a modern, agile company that could go head-to-head with any of its younger competitors. Now we were finally ready to write. Our go-to starting point when we write websites is the homepage, which makes sense. This is a website’s front door and welcome mat. The flow and wording of the homepage is also a microcosm of the rest of the website. Once you settle on a voice and style here, you’re pretty much locked in, so you need to get it right before you proceed. But we had one more factor to consider: core audience. We had to decide who we would speak to first, the small businesses or the financial institutions, or something in between. After some back and forth, and plenty of coffee (beer), we went with the businesses—for a reason. Most of JCC’s customers aren’t banks. They’re local merchants looking for simple, efficient, reliable payment solutions. So it was only natural that JCC would give them the most valuable real estate on their website: the homepage banner. With the finished sitemap (the website’s new structure) and homepage approved, we got to work on drafting (and editing!) the rest of the content. This was the most rewarding part of the process: carrying out an open dialogue with department heads at JCC, deciphering the institutional lingo and repackaging it into content that would revitalise JCC’s online brand and create the shortest path between users and the submit button on the contact form. We’re word people and would love to tell you how we did all that, but you can actually see for yourselves. Check out JCC’s brand new story, and everything in between, live at their new website. Do you need stand-out content for you new website? Feel free to tell us a little more about your website. Just one sec. We’re processing your request. Dear Storyline, what is a user journey and can I charge clients for this service when I'm writing websites?